As photographers, we are always after images that have a strong impact on the viewer. 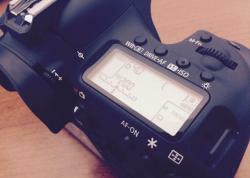 Of course, nice colors, good composition and a good mastering of your photographic equipment and technique are essential. But in underwater photography – like in most types of photography – you also have to tell a story. Behavior is a very good way to do so. "How did he get that shot?" This question is the greatest compliment you could receive on a behavior shot. Here are 3 straightforward tips that I would recommend to anyone asking that question. There are always lucky shots and if you dive with a camera often enough you will capture special moments. However your chances to get it done on a more regular and predictable basis increase if you learn more about your subjects. Some key behavior shots are reproduction (mating, spawning, courting, laying eggs, guarding eggs, hatching, nesting), feeding and cleaning. So you need to know where your subject lives, what it feeds on, when and where it mates, where it lays its eggs – and what time of the month and day it does it. Is it a cleaner? Does it get cleaned – and if so – by whom? Where is the cleaning station? 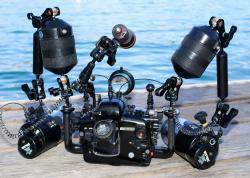 These are all questions you should ask the dive guides and dive operators you are diving with. You should then make a plan based on this information, choose the appropriate lens and go shoot. 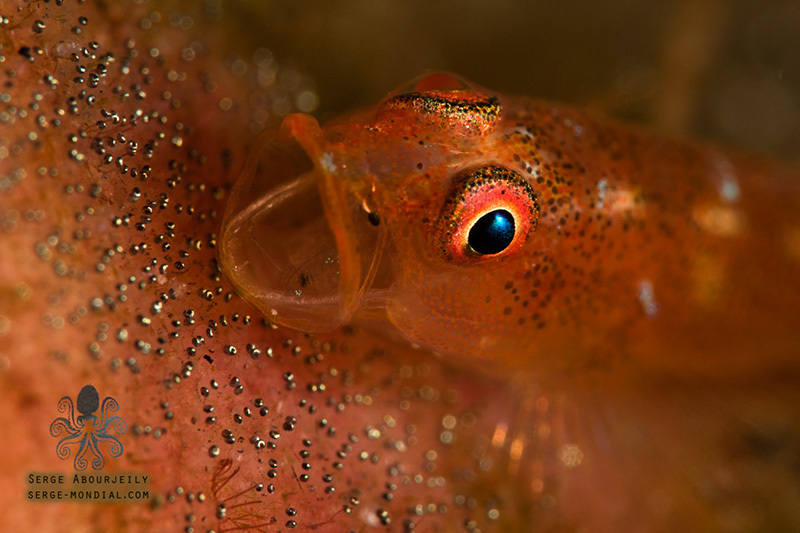 Little Gobies stay with their eggs. Watch their position ... even if they move when you approach, they’ll come back to the exact same position. If you watch fish or other animals, their movements and behavior often seem random at first. Here it pays off to observe before shooting. Watch what your fish does. Displaying male fishes, fishes in cleaning stations, courting fishes ... they often follow movement patterns that you can use in your favour. Learn how to position yourself in a spot to where you know your subject will return. This will not only help you to get the best angle, but also to set up your camera and strobes for this particular angle and create the image you want. This strategy is clearly better than swimming behind your subject and leaving the results to pure luck. 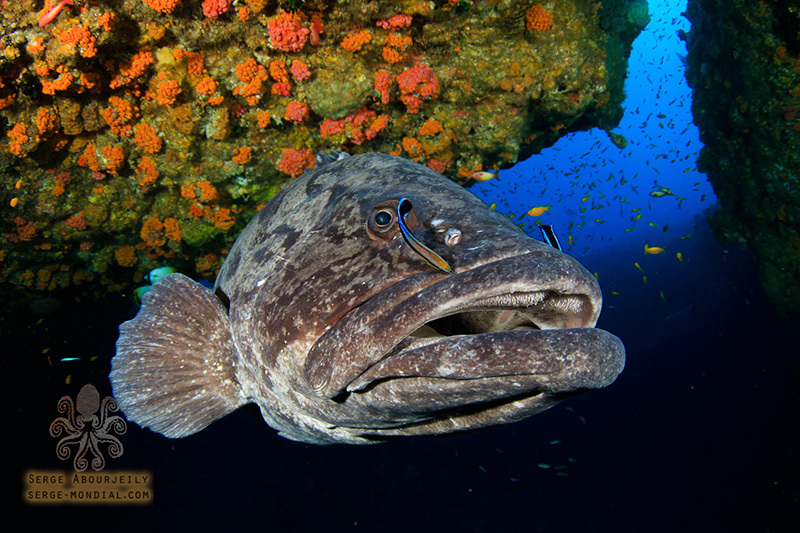 Big Groupers in caves or under overhangs are often in company of cleaner wrasses. They are not very shy and you can get very close – watch your strobe position! 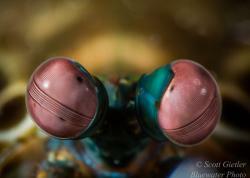 In underwater photography you always want to be close to your subject. The problem with behavior shots is the comfort zone of your subject. If you go too close, they often stop doing what they would be doing if you weren’t there. The key is to become invisible. Of course, not literally... but there are ways to make subjects more tolerant towards you. Much more tolerant if you do it right. The first thing is always to choose the right subject. If you have a choice of several, then always go for the one in the best position and/or the one that seems least shy. So if you want to become invisible to a garden eel you have to choose the one that lets you come closest before retreating into his hole. Then you can start working on becoming invisible by simply approaching in a sensitive and observing way. Use good buoyancy control, move slowly, exhale slowly and steadily – even with small bubbles only from your mask if you have to. And always watch your subject. 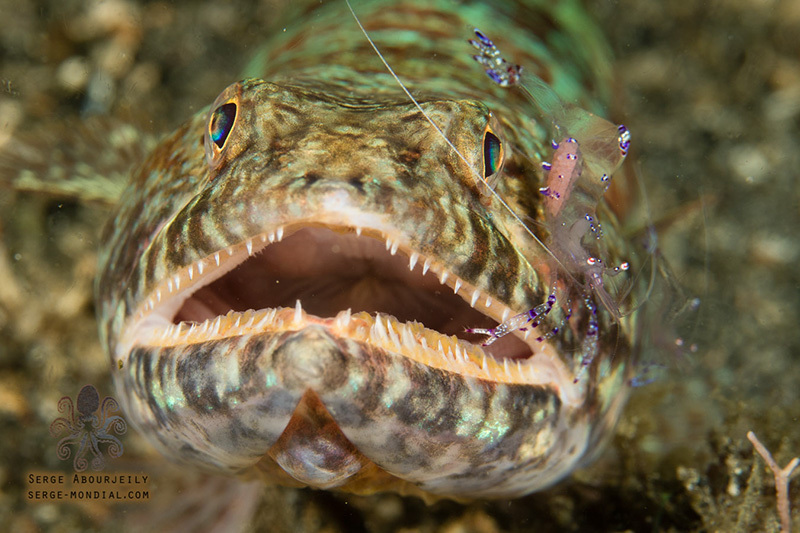 Whenever it starts changing its behavior (for example, a garden eel that stops feeding and begins to retreat, or a goby warning its shrimp and freezing its motions) you have to stop. Breathe even more carefully, move even slower and maybe even move back a bit. As soon as your subject starts behaving normally again you restart your approach with the same care. Repeat this cycle several times. You will see, that after some time you will end up much closer to a relaxed subject than you would have guessed is possible. Spending 5-20 minutes just stalking and becoming invisible can pay off for some shots. Cleaner Shrimps often hang around little anemones. Locate those cleaning stations and see what’s around. Lizard fishes are very common visitors and are relatively easy to capture as they stay around for a while. For me, these three steps work really well and I think you should give them a try. But in the end, don’t become blind to everything else around you when working on a behavior shot. Just because you are planning to capture one specific behavior doesn’t mean that other stuff doesn’t happen. So keep your eyes open – the more knowledge about behavior you have in your head (Tip number 1), the more chances you will get to capture it. 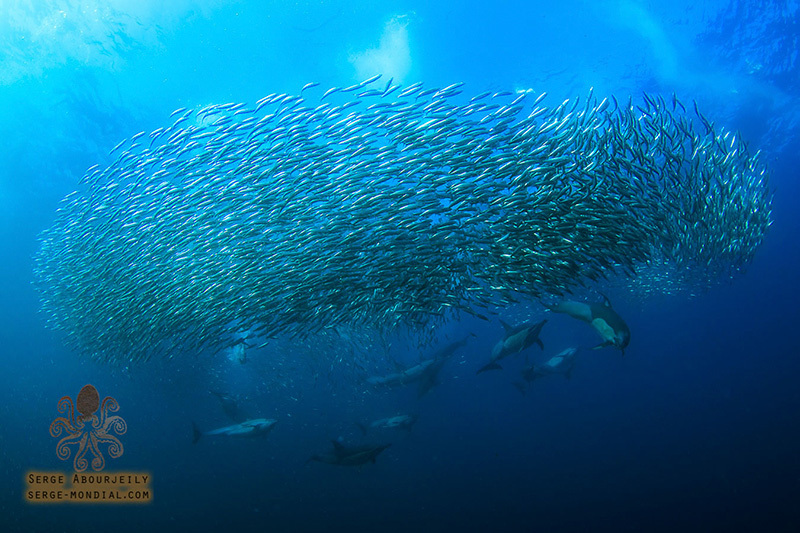 Sometimes the best preparation for a behavior shot is not done by yourself but by very experienced dive operators – like the skippers on the sardine run in South Africa. They learned how to observe the birds to spot baitball action. 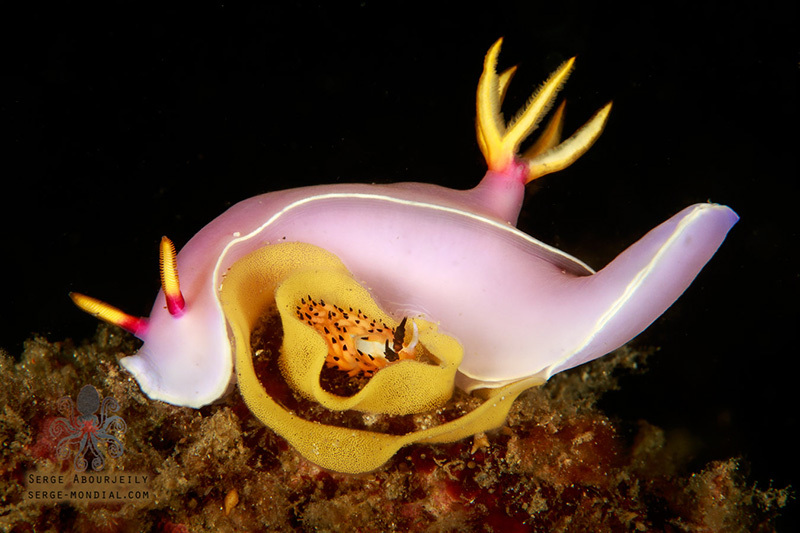 This Hypselodoris bulloki is laying its egg ribbon while it’s beeing eaten at the same time by a Favorinus Nudibranch. 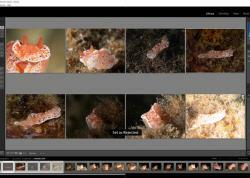 Always watch Nudibranch eggs very closely! 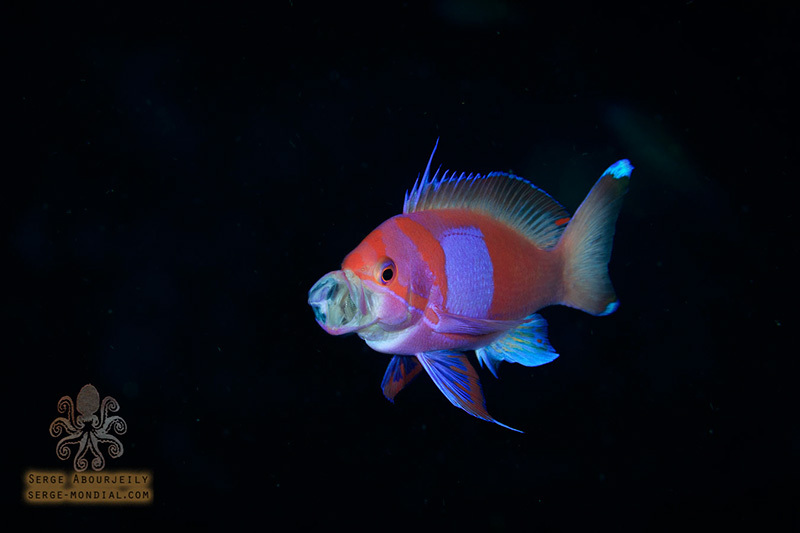 Male Anthias have lots of females, and they protect them against intruders … and if you stick around long enough also against yourself. Find the right spot and wait fort he right moment. Serge Abourjeily has been a u/w photographer since 2005, living and working in Indonesia. He has spent the last 7 years in the famous Lembeh Strait (recently as Dive Manager at NAD-Lembeh) where he collected a lot of experience with critters and macro Photography. Beginning in 2017, Serge will be working on the Samambaia Liveaboard, cruising the Indonesian seas enjoying wide-angle AND macro.